What do you do if one day you realize the job you've loved all your life simply isn't cutting it anymore? If you're in a company you might shop your resume around. But what if you're an artist? Here's the story of a man who changed his art, and how the art changed the man. St. Paul, Minn. — Matthew Smith walks through his music studio, occasionally tapping on a set of chimes, or banging on a drum. Smith is a tall, pale man who looks slightly haunted. In his mid 50s, he's an accomplished artist. His work has received rave reviews from critics and sold quite well. But that was when Smith was a painter. Now Smith is a composer, and has just released his first classical CD. Next door to his attic music studio is his painting studio. A single canvass adorns the wall. A table sits to the side; it's covered in oil paint several inches thick. The layers are so deep that even though Smith hasn't touched a brush in six years, the paint is still wet. Smith says his mother's death triggered the switch from painting to music. "I could no longer express the depth of feelings and the multiplicity of feelings that I had in a visual form," says Smith, "and I found that music was the medium that had the direct connection to the kinds of emotions that I was feeling." Smith suffered through an extremely difficult childhood. His mother was in and out of a mental institution when he was just an infant. When he was four, she entered the institution permanently. "Each time she was in the institution, no one talked about her," says Smith. "My grandparents, my father - they never knew either what was right or appropriate for children, plus they certainly were not comfortable with this themselves." Smith didn't see his mother again until he was in college, and from then on visited her about once a year until she died in the institution in 1997. "So all of these qualities of loss and return, loss and return and then the ambience in the house of fear and grief and all that was unspoken was a place that I had been aware of, but had never gone to it so directly as I was now forced to do when she died," says Smith. For a little over a year, Smith painted bouquets of flowers. Groveland Gallery director Sally Johnson still sells Smith's paintings. Johnson looks at the remaining paintings stored in her back room. She describes them as dark, almost violent. Clusters of tulips and gladioli stand out against a blood-red backdrop. Johnson showed Matthew Smith's work for 10 years. His last show was a series of sunflower paintings. The flowers were agitated, in varying states of decay, with a stormy sky looming in the distance. She says his paintings always left you with a feeling that you'd actually been somewhere, that you could smell the air or feel the wind. But she admits if he had continued to crank out paintings when he wasn't feeling inspired, she knows they wouldn't have been as good. "I admire him," Johnson says. "I'm disappointed - I loved having his paintings here - but I admire him for the bravery and courage it took to give up something he was so very good at and so very successful with and forge off in another direction not knowing what would happen." For over four years, Smith became a near recluse. He spent most of his days in his attic music studio. He only came down to be with his family and for rare social occasions. His wife Lauren Stringer is a children's book illustrator and author. They met in New York where they both had studios; all their friends were painters. "Mostly music seemed like something on the side even though I bought him a toy piano for our first Christmas together," says Stringer. "But painting was how we met and visiting each other's studios was what we did." When Smith turned to composing, things changed. Stringer would work in her own studio on the second floor of the house, listening to her husband's music float down from above. She says watching his transformation was difficult at first. "It was really mixed," says Stringer. "I was in mourning for quite a while. I'm a huge fan of his paintings, I love his paintings. But he went full force into it and the music that was coming out of there so amazing and phenomenal to me that it came from the same place to me that his paintings did and I completely understood." 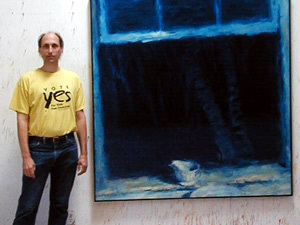 Indeed Matthew Smith says his music and his paintings have a lot in common. They evoke the same mood, they both have a sense of agitation and movement, and they both are made up of layers upon layers of either paint or sound. Philip Blackburn agrees. Blackburn is Director of Artist Services at the American Composers Forum where he runs the innova recordings label. Innova released Smith's first CD -- Archaic. Blackburn says listening to Smith's music is like being at the tip of his paintbrush. "It just jumps out at you," says Blackburn. "It's immediately appealing. It has a sheen, it has a texture, it has a color to it, and it draws you in in such a way that you can never press the stop button. You can't just listen to five seconds of this and turn it off and figure out how the rest of it is going. You've just gotta keep on listening to it." Blackburn compares Smith to Arnold Schoenberg and Brian Eno, musicians who were also heavily involved in painting and design. Matthew Smith says the music has served its purpose. It's allowed him to explore a painful past more completely, without becoming stuck in it. "It has all the qualities of the grief in it but it also has a great deal of energy and drive that I would associate with bringing myself into the present, being more alive - becoming whole - becoming whole in a way that includes the past and the present." Smith says one of the benefits of switching from painting to composing is that he no longer identifies himself so strongly with his artwork. He can let it go if he has to, and move on to something that better expresses his vision. In fact, he's already over 100 pages into writing his first novel.